Churchillians will not be enamoured by this astringent portrait of their hero on the eve of D-Day. Unfortunately the scriptwriter, historian Alex von Tunzelmann, has got her history all wrong, unfairly reducing Churchill to a pathetic, doddering and deluded old fool. He may have outraged and frustrated the military at various times during World War 2, but this movie’s claims are ridiculous. We first meet Churchill, played with jowl-quivering passion by Brian Cox, on an English beach on the south coast just before the Normandy landings. Accompanied by his long-suffering wife Clementine (played with gimlet-eyed sharpness by Miranda Richardson, the movie’s one grace note), Churchill is haunted by the Gallipoli landings of 1915, a military disaster that cost the lives of many thousands of men and almost destroyed his political career. At all costs, he mutters, something similar must never be repeated on his watch again. The problem is that, while Churchill is the British prime minister, ultimate military authority resides in the hands of General Dwight D. Eisenhower who has resolved that “Operation Overlord” will go ahead, weather permitting. For much of the movie, Churchill is depicted as an extinct volcano, raging against military decisions that he has no power to control. Looking old, tired and behaving with exceptional grumpiness, he takes out his frustrations on everyone in his circle, not least British commander Field Marshal Montgomery (Julian Wadham), “Ike” (John Slattery), Clementine and even his young secretary (Ella Purnell). No wonder the grossly under-appreciated Clemmie, who objects to “living on the edges of Winston’s world”, is sorely tempted to leave him, while Montgomery almost comes to blows with him. It is left to former Boer leader Jan Smuts (Richard Durden) to act as Churchill’s minder, keeping him out of even worse scrapes. Sadly, amidst all this melodrama, we are being led up the historical garden path. While Churchill certainly had his doubts about opening a new front in 1942 and 1943 – much to Stalin’s frustration – he was one of the strongest proponents of Overlord and he would certainly not have resorted to this kind of schoolboy squabbling on the eve of the invasion. One particular scene, in which he kneels at his bedside and prays for bad weather to cause Overlord to be aborted, is little short of farcical and one has to feel sorry for Cox, a fine actor, who is reduced to mugging. 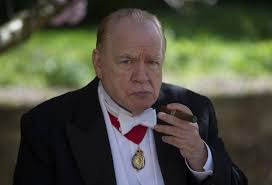 Churchill, an indubitably great but hardly flawless man, has been the subject of many films and mini-series, and he has mostly been treated with undue reverence. If a film-maker is intent on putting the boot into him, however, there is no shortage of genuine opportunities, notably his betrayal of Poland, but this film, apart from its staginess and faked up scenes, represents the lowest of blows.